Check it out ... I'm on day 4 of my Deborah Lippmann Constant Craving manicure from the Elizabeth Arden Red Door Spa and there's not a chip in sight! 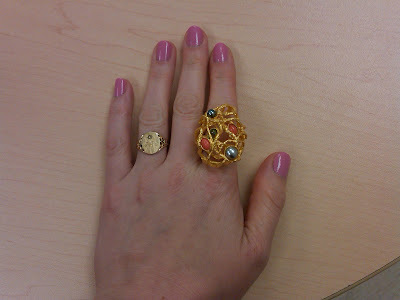 Plus, here's a shot of my brand-new Alexis Bittar ring. I am in LOVE! Beautiful!! Which Red Door did you go to?